We love Altus for the powerful winemaking statement it asserts with each vintage. Six weeks of dehydration on racks and five years of fermentation and oxidative maturation in barrel create unmistakable characters of wax, dark honey and marzipan, alongside a suite of less expected treats: tropical fruit, crème caramel and pungent blossoms. This vintage has the lovely, gravelly texture and bitter hints of cooked quince. To be sipped gently. Inspired by wines tasted during our travels through Tuscany, this is a divine oxidative style dessert wine. Made from estate-grown NGERINGA fruit, predominantly Viognier with our small quantities of Gewürtztraminer, Pinot Gris and Pink Semillon. All the grapes are very gently hand harvested, placed on drying racks previously used by Jurlique for drying herbs, and left to more than double their sugar concentration from about 13 to around 30 degrees Baumé by process of dehydration. The grapes were picked at a low Baumé and dehydrated on racks for six weeks, then pressed over several days into an old French barrique. Left to ferment and oxidatively mature without topping for five years. Traditionally in the making of this type of dessert wine the bung is cemented in and the barrels are neither topped nor even opened for 4 to 5 years. 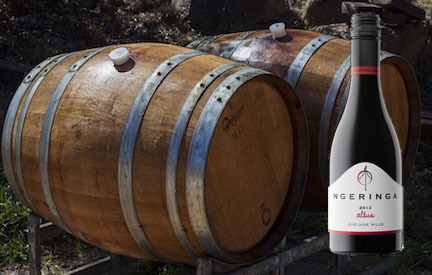 Although we do not cement the bungs as we like to follow the wines progress during its time in barrel, the barrel does remain un-topped. A wine of the saints! Wild fermentation, spontaneous malolactic fermentation, no temperature control. No fining. Estate bottled. Across Australia, the 2012/2013 growing season was characterised by record-breaking heat and infrequent, scant rainfalls. Indeed, in the Eastern States – and even closer to home – many vineyards began irrigating in the late winter in anticipation of a devastatingly dry spring to come. In years such as this the Adelaide Hills’ typically higher precipitation and lower temperature stand us in good stead. Our minimally irrigated vines – with strong, healthy roots deeply embedded in the cooling soil – steadfastly withstood the drier weather and benefitted from the cooler nights. On the positive side, as well, there was essentially no disease pressure throughout the Hills leaving us and our vines only the vagaries of the climate to contend with. Good warmth toward the end of February and during harvest ensured excellent ripening in the final few weeks of the season. The upshot was a vintage with good yields, similar to our bumper 2010 crop levels although without the same evenness. Vigilance was required during this condensed, four-week harvest to ensure that fruit was picked at optimum maturity from the different parts of the vineyards. Wines from this vintage tend to be plush, well-rounded examples of their variety.